So, what about us? 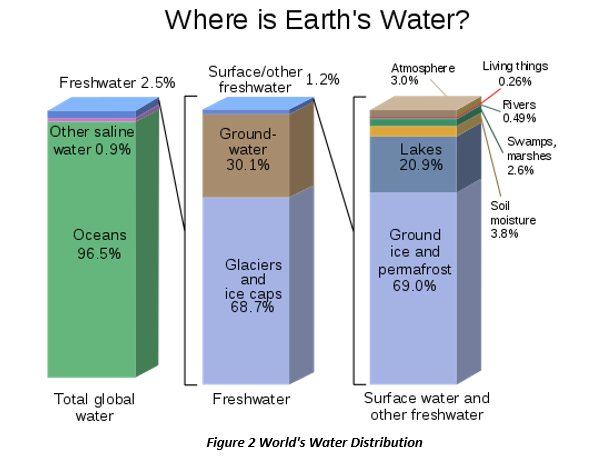 Where is the water on our planet? Turns out the answer is the same; just about everywhere! There is up to 11 times as much water as in all the liquid water oceans deep underground, from 400 to 600 kilometers deep. The biggest share of this water is chemical bound as hydroxide ions in a beautiful blue mineral called Ringwoodite (also known as WaterSeer Blue). 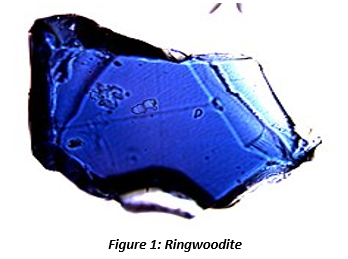 Ringwoodite may be the most abundant mineral in the lower part of the planet’s mantle transition zone and was first found inside diamonds recovered from the deepest mines. Kind of cool that deep earth water hydroxides, precious and abundant, would be so beautiful, so unobtainable, and first found inside diamonds! So, what about the water we see every day? Still everywhere! Sea Water covers over 70% of the surface and 90% of the biosphere. That’s over 360M square kilometers or 140 M square miles. The oceans and seas contain 97.5% of the world’s water, a total of 600,000 cubic miles! Surely that is enough water! But what about the water that we can use? We can’t drink sea water, can’t use it to grow food or raise cattle. We can’t even make cement out of salt water. Except for sea animals and plants, the oceans are pretty useless to people when it comes to water. What about the fresh water? Still lots of water, but the numbers are starting to get a lot thinner. Of the 2.5% of the world’s water that is fresh (non-saline), about 69% is frozen in the polar ice caps and in glaciers at very high altitude. Most of this water covers Antarctica and Greenland and will remain inaccessible. Another 30% is in ground water aquifers, of which all is heavily mineralized, and much of that is salt water that is thousands of years old. The remaining usable fresh water aquifers are being depleted faster than they are being replenished. Well, there is still a lot of surface water, right? What about the lakes and rivers? Only about 1% of world’s fresh water is on or in reach of the surface. Unfortunately, most of that is in the ground as ice and permafrost. A fraction of that fraction is what we see in lakes (20%), swamps, wetlands, and liquid soil moisture (6%), and in all the rivers (0.5%), most of which is in rivers like the Amazon, Nile, Yangtze, and Mississippi. Howver, we still have a problem getting the water where it should be. While just a very small fraction of all the available surface water is considered fresh (non-poisonous) and accessible (in a liquid form), the remainder is concentrated in a few places, not always in the right place, and rapidly running down to the salt water oceans. And we haven’t talked about fresh water pollution, pathogens, or industrial mineralization. Unfortunately, there is just not as much fresh water as we would like or need, and what we have is not distributed the way we would like. There is one more source of water. It is 3% of the total available fresh water and is completely unpolluted and disease free. It is literally everywhere on the planet, for free, unclaimed and unowned, and is replenished every single day, no matter how much is removed. In fact, as the planet warms, this water source is becoming more abundant, not less, just as every other source of fresh water is declining. This source of water is in the air. There is 3100 cubic miles of fresh water in the air all around us. That is almost over 1700 cubic meters of fresh water for every person on the planet. One thousandth of that is almost 500 gallons per person per day, and it is replenished daily. That small fraction is 100 times the minimum daily adult requirement. With all this water, almost a third of the people in the planet still live with water scarcity . Many will not have a drop of fresh, clean water today. Even in wealthy, technologically sophisticated countries, the population depends on large distributed water treatment systems. Only the smallest fraction of the world population has a private well, and most of those are running dry. No one has water security and independence. Why aren’t we getting this fresh water out of the air? It is everywhere around us! Shouldn’t everyone have water in abundance? Do you want to help change this? Join the WaterSeer Community! Want to get free of your regional water worry and water restrictions? Declare your own water independence (www.waterseer.org)! Want water for the poorest places in the world? Find out about WaterSeer for the World Foundation! And you can help bring water abundance to the world!